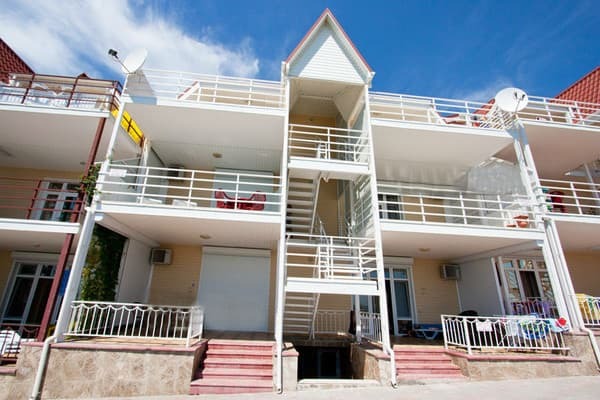 "Elling number 4" is located 20 meters from the sea in the resort village Ordzhonikidze. It offers accommodation in 3 spacious comfortable rooms. Each room of the hotel "Elling №4" has a terrace, which offers a wonderful view of the Dvuyakornaya bay and the beach. The rooms have a refrigerator, an electric kettle, a microwave, a TV, air conditioning, and a bathroom. Hot and cold water constantly. Rooms are suitable for 4 to 8 people. On the furnished territory there is a brazier, a parking lot. Guests are also offered sun loungers. By prior arrangement, you can arrange a transfer. 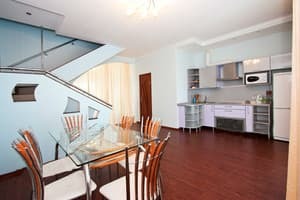 Here all conditions for a comfortable and interesting holiday are created. Description of the room: The room is on the 1st floor and occupies the entire floor of the bike. 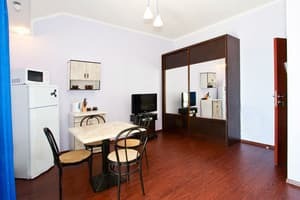 The room is spacious and consists of 2 rooms. Settle in the room can from 2 to 4 people. In front of the room there is a large terrace. Room with kitchen. Description of the room: The room is on the 2nd floor and occupies the entire floor. The room is spacious, consists of 2 rooms, one room - a kitchen, the second - a bedroom. Settle in the room can be from 2 to 4 people. In front of the room there is a large terrace. Description of the room: The room is on the 3rd floor and occupies the entire floor. The room is spacious, big, consists of 2 rooms, one room with a kitchenette (no tiles), the second is a bedroom. Settle in the room can be from 2 to 4 people. In front of the room there is a large terrace. Elling is located 20 meters from the sea in the resort village Ordzhonikidze. By train to the city of Feodosia, then a shuttle bus to the town. Ordzhonikidze. The stop is Bighorn.